Reed College canyon stream with quartzites and basalts. The Geologic history of the watershed can be read from the rocks in the creek. Grey basalts originate either from massive Columbia River Basalt flows from Eastern Washington and Oregon, or from local Boring Volcanoes. Orange quartzites were brought here from Idaho either by the Columbia River or by catastrophic Missoula Floods. ICE AGE missoula flood waters inundated the portland basin ((Lake allison) scouring thevolcanic buttes in the process. Incised meanders of Sandy River at Oxbow Park demonstrate uplift and show layers of river rock and glacial loess beneath the headwaters. 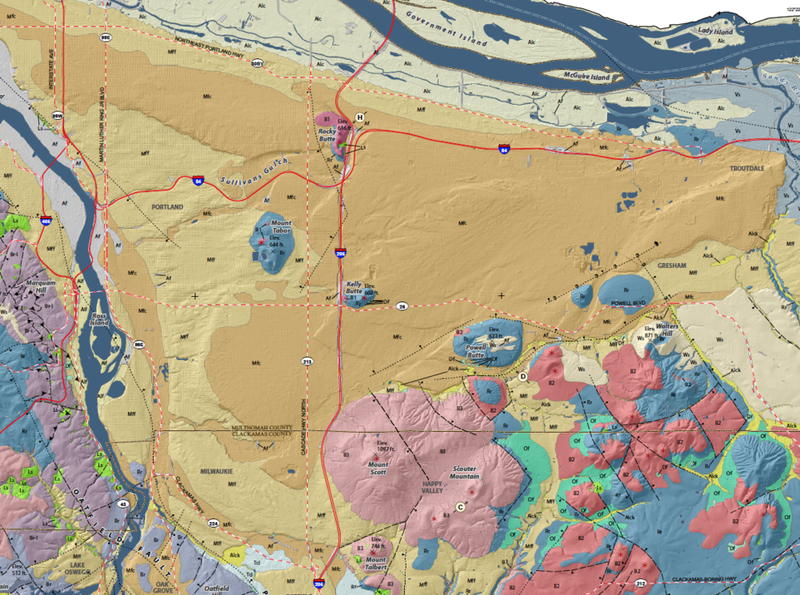 River rock layer (Troutdale formation) is the ancestral Columbia River bed. Quartzites are its signature rock. Fine glacial loess from recent periods of glaciation is bad for landslides but good for farming. 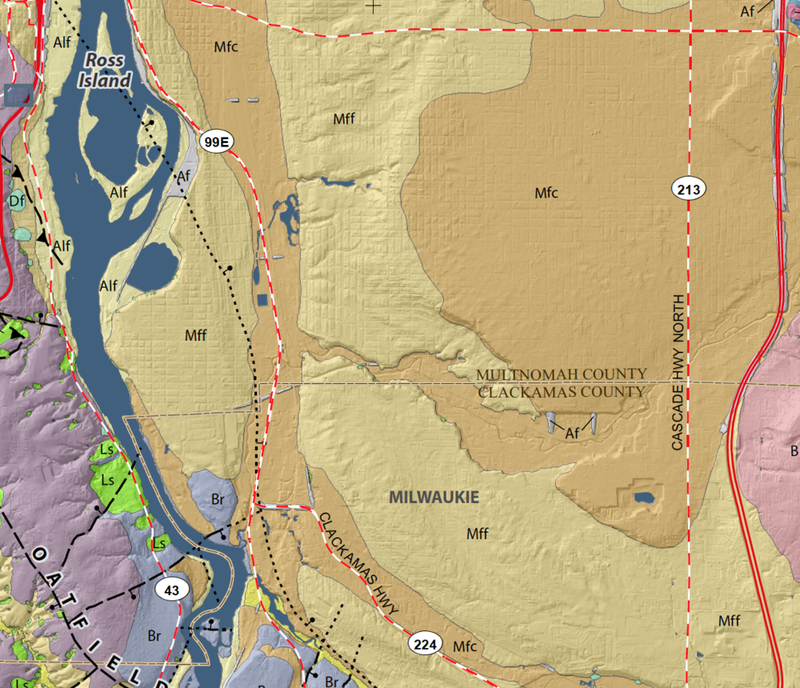 Headwaters plateau (in red) with incised meanders of sandy river showing uplift. 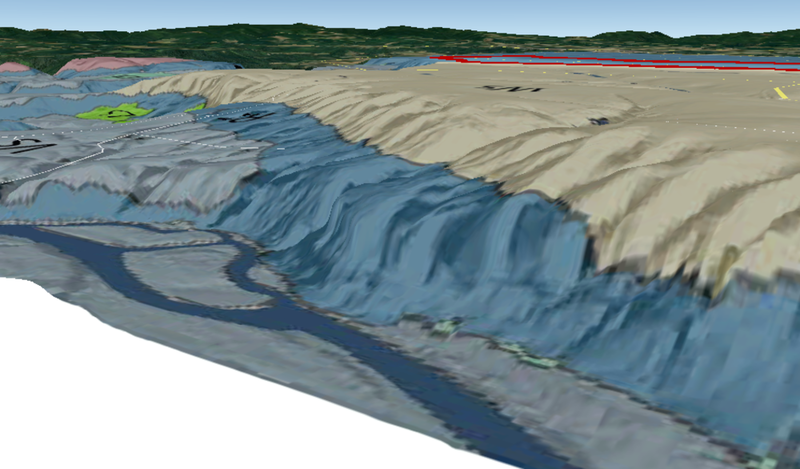 View of plateau from sandy river showing layer of river rock (blue) and Loess (cream). 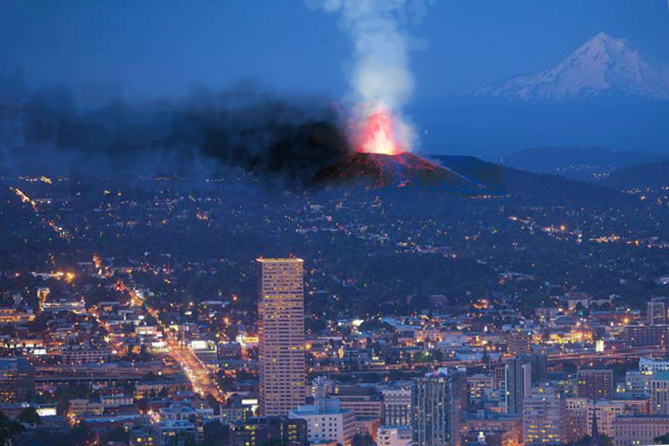 The Boring volcanos are numerous, mysterious, and will occur again in Portland's future. The volcanic buttes provide cool water temperatures good for salmon habitat. Boring lava field contains 32 cinder cones Aged 2.7 million to 50,000 years ago. water cooled by buttes is good habitat for salmon. 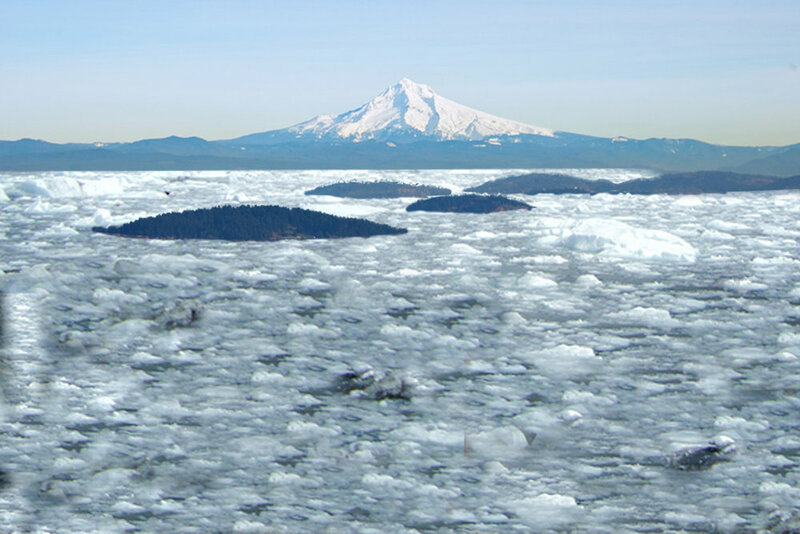 Catastrophic Missoula floods inundated the Willamette Valley at the end of the last ice age. The floods brought Idaho quartzites, Columbia River basalts, Cascadian Andesites, and anything else in their path (including meteorites). Floods bursting through the Columbia Gorge left an apron of coarse sediments stretching across Gresham and East Portland, scouring the buttes. Coarse sediments are (1) contain granites and are a radon hazard, (2) create rocky soils less hospitable to plants, (3) are more erosion and earthquake resistant. Flood waters ponded in the Portland basin creating Lake Allison. The lake's slack waters left layers of fine sediment (mud and sand) behind. Missoula fine sediments (1) create fertile soils good for agriculture (but bad for grapes) and (2) are bad from the standpoint of erosion and earthquake hazards. 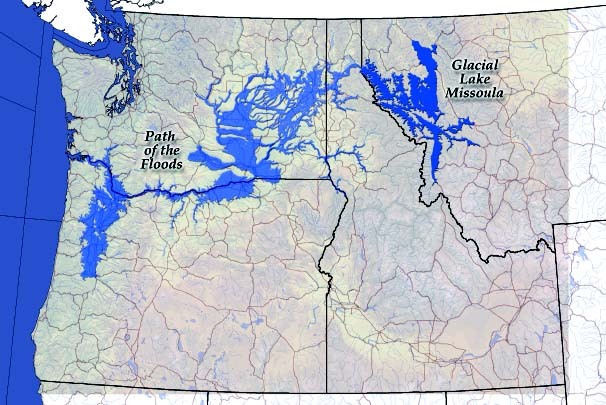 Flood waters from Glacial lake missoula emptied into the columbia drainage and backed up into the willamette valley. an apron of coarse sediments (dark tan) were deposited first as the flood slowed coming out of the gorge. fine sediments (light tan) were deposited where water ponded in temporary lake allison. 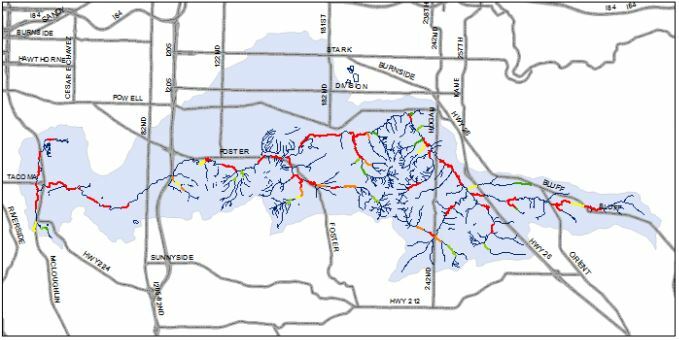 The North-South dry channel facilitated the building of the railroad and adjoining East Side industrial development. 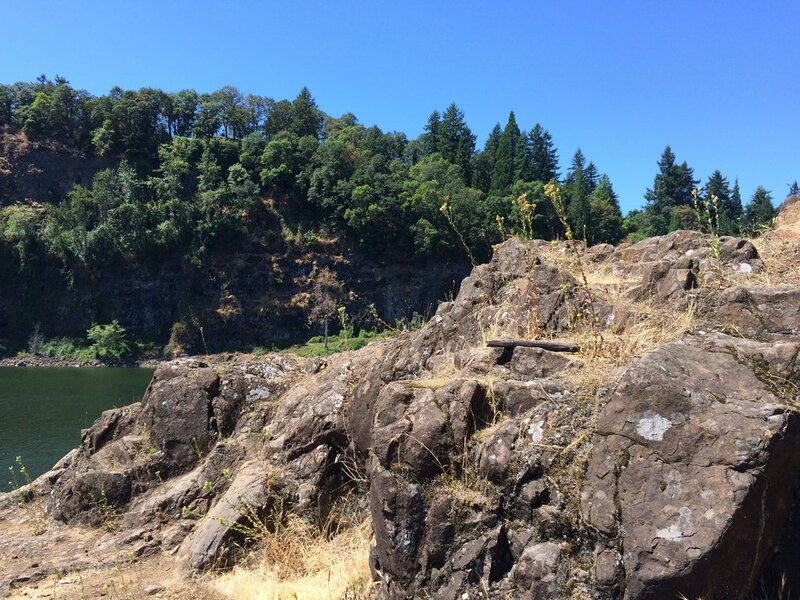 The Willamette confluence/Elk Rock area contain the 40 million year-old Waverly Formation, the oldest rocks in Metro region. johnson creek makes a sharp left south at the dry channel. waverly formation basalts are an accreted terrane over 40 million years old.